If you run a hotel, B&B or want to let out your holiday cottage, gîte or villa, wwwhatever can provide you with a booking system. 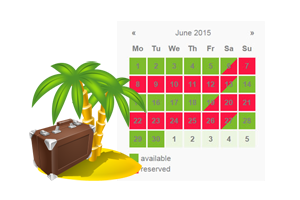 A calendar will be displayed on your booking page, colour-coded to your brand. You can decide how many months are displayed and, of course, your potential customer can tab along the months to view the month when they would like to stay. When a customer selects the days or weeks they want to rent an email gets sent to you. You then log on to the booking system and confirm, or otherwise, the booking. Confirmation emails are provided and the wording of the email can be customised. Once set up and integrated with your website, the administration facility gives you full control. You can also choose to accept payment for the booking, a holding deposit or full payment, depending on the number of days between the booking and the start day. However, most of our customers are letting out their own private accommodation and prefer to talk to the customer first. Payment is then taken over the phone or some other arrangement.